I absolutely love the novels by Katie McGarry that I've read: Pushing the Limits, Dare You To and Crash Into You. 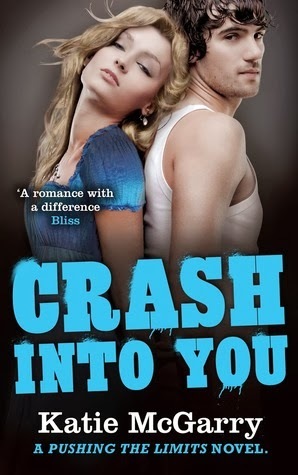 I didn't think any book could top my love for Echo and Noah as I love them so much ... but I loved Crash Into You more. Something about Isaiah breaks and melts my heart simultaneously. Also, I included the US covers of Pushing the Limits, Dare You To and Crash Into You because those are the covers I prefer. The UK covers look very different! And please do follow Bookish Brits: on YouTube, on Twitter, on Facebook, on Tumblr. Thanks! I loved this vlog so much, Clover. I don't tend to watch blogs very often and so this was the first Bookish Brits video I've seen, although I'd heard about them before and thought they were such a fantastic idea. I will definitely be watching them more often now! I've seen Katie McGarry's books around but I wasn't sure if they were my thing - based on the covers I thought they looked a bit trashy, if I'm honest. But I didn't really know what they were about and now that I do I really want to read them, the mental health aspects sound really interesting. I hope you enjoy The Princess Diaries! I won't be reading them as I'm really trying to get through my TBR pile at the moment, but I remember loving them when I read them a few years ago. The cat, Fat Louie, was always my favourite character! I definitely wouldn't describe these books as trashy! They are very heavy on the romance in each of them, but they also have really interesting characters and relationships with friends and family. Things to work out within themselves and it's all very addictive reading from all three of the books! I really do highly recommend them.